"Kikuyu is the second most widely spoken East African local language. It is not only spoken by the Kikuyu but also learned as a second or third language by many non-Kikuyu people who live in Nairobi and surrounding areas of central Kenya. This language is understood by most of other Kenyan Bantu groups. It is a language of commerce (used by traders or used in trading) and transportation." 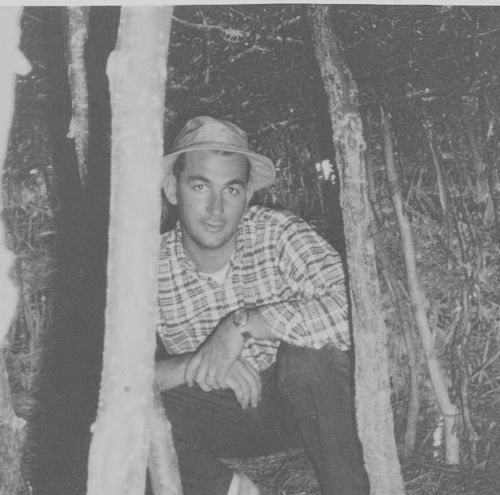 Here Ed is seen in a Masai dung hut. We had passed a Masai "village" on the move shortly before we came across this deserted boma. Our guide explained that Masai are nomadic. They build a circular enclosure for their cattle from dried thorn brush, anchored every 10 feet or so by these very small stick framed and dung plastered sleeping huts. When the surrounding grasses are used up by the cattle, the village moves on. "For the Masai, cattle are everything: food, material, culture, ritual. Cattle are life. "I hope your cattle are well", they say in greeting. More than any other Kenyan people, the pastoralist Masai are a cattle-herders par excellence. Cattle provide almost everything they need for survival, and much more besides. They are a symbol of wealth and a source of pride, and a person's entire life revolves around the herds: the need to pasture and care for them, the need to protect them, and the need to move with them in search of fresh pasture and water. The paramount importance of cattle - the more the better - have also marked the aggressive nature of Masai relations with their neighbours: warfare was inevitably fought over land and grazing rights, and cattle raids were essential in guaranteeing a family's prosperity, as well as to massage the warrior's ego and enable him to get married (for which he needed cattle)." Oh my, there is so much more to learn - wish we'd had internet connections and Google in 1965. "As the Masai traditionally eat neither fruit nor grain, milk, either fresh or curdled, is the basic food staple, and is often drunk mixed with blood (the mixture is called nailang'a) in the dry season, when milk yields are low. It is generally stored and carried in long, decorated gourds which are washed with urine (despite our western preconceptions, urine is totally sterile when fresh, and thus acts as a mild antiseptic). Milk itself - the gift of Ngai's cattle - is symbolized on ceremonial occasions by the application of a mixture of white chalk and water to the bodies of participants. Once a month, blood is also taken from living animals, usually to be mixed with milk. This is done as follows: a noose is tightened around a cow's neck, causing the jugular vein to swell. A short blunt arrow with a 1cm tip and its shaft bound with twine, is then fired at close range from a loosely-strung bow to puncture the vein. The blood which spurts out is caught in a gourd. The wound is not fatal and is stopped afterwards with a wad of mud and dung to stop the bleeding: all in all, not that different from people giving blood. The Masai believe the blood makes them very strong. Curdled blood is called osaroi. The living animals also provide dung, which is used as fuel and to plaster houses. The urine has some medicinal and cleansing qualities, and is also used in building. Cattle are only rarely slaughtered, and this only in times of famine, ritual purposes (such as by warriors seeking strength before a raid), or when the animal becomes too old or lame to be of other use. Instead, meat is obtained from large herds of sheep and goats (around 150-200 per family) which the Masai also keep. Game meat (including fish) is taboo, although eland and buffalo meat is allowed, as they are considered 'wild cattle'."